Colchester United boss Joe Dunne believes a refereeing decision has cost his side the financial benefits of a potential FA Cup run. With just 2.506 in attendance, the U's kept one stand closed. "You see a main stand shut because we can't afford to open it, and we can't go through because we've been done by an official," Dunne told BBC Essex. "We deserved a replay, and that would have given us another crack to get through." 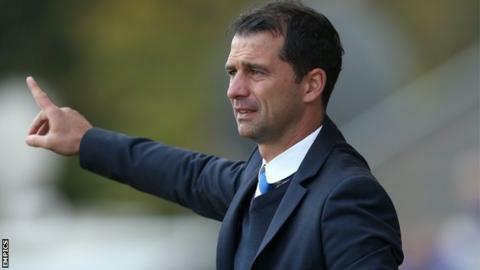 Colchester, who have averaged attendances of 4,178 in League One this season, were 2-0 down at half-time, with Dunne describing his side's first-half performance as "garbage". But they battled back to 2-2, only for Chris Porter's 81st-minute penalty to deny the Essex outfit a replay at Bramall Lane. "We had a League Managers' Association meeting in the summer and we went through a whole raft of handballs because they thought there were too many given," said Dunne. "Mags has got no time to react. It's not a penalty. I want anyone within PGMOL (Professional Game Match Officials Limited, the organisation responsible for referees) to warrant that penalty to me. "You know what they'll do? They'll say sorry. It's no good, we're out of the cup."